Okay, I'll pick up things and juggle them whenever I get bored; that's a given. I used to worry about seeming like I'm showing off. But hey, why learn to juggle if you're not going to show off now and then? We went to a Round Rock Express ball game with my sister and her husband this week. The parklike atmosphere of the .... ball park ... always makes me want to juggle, and I actually juggled there when the cub scouts paraded on Scout Night. But I hadn't brought anything to juggle. The giveaway that eve, though, was Mr. Potato Heads (with baseball player paraphernalia). So I ended up carrying three or four of them around. And so I had to juggle them. They were funny things, too. I mean, the potato part was a good juggle item, but everything was in a plastic bag along with it. I noticed that even though THIS version of Mr. Potato Head doesn't have an opening for storing accessories inside it, the makers had scribed a groove for a pretend opening anyway. I'm not sure what the point of modeling a pretend compartment is. So I'm standing around juggling these things when we're walking around the park, or when I'm waiting for my family to go to the bathroom (three kids, it takes a while). I heard some teenagers hollering things at me..."Oh, you should be on TV" or something like that, but in a snide way. It was nice to be grown up enough to ignore that. And then a few people stopped and were really enjoying the juggling. 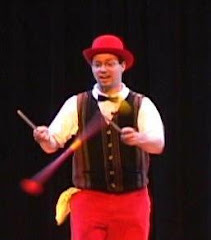 Same sort of material...pretty routine ball juggling, although I hammed it up for the nice people, of course. But the reaction was completely different. I spend a lot of time elaborating my act with lots of additional props. It's interesting to see the fun people can get out of something so simple as me juggling three objects I happened to bump into. On June 12 I went and peformed a small piece for the Riverbend church's Vacation Bible School program. The church's VBS program was huge: 840 kids, and the portion I was involved in took place in a giant 3-story auditorium. The theme was an amusement park, and there was a large motorized ferris wheel, maybe 20' tall, with cardboard seats and riders. And there was another 15' model of an amusment park ride. These were heavily decorated with painted cardboard. I like to come up with cardboard projects, but these folks put me to shame. Someone told me they used something like 85 9x6-foot pieces of corrugated to do the stage dressing. They had stapled the cardboard to wood frames and painted it all...and the paint job was good. There was an impressive amount of creativity in this program, as well as a lot of hard work and some neat engineering. You could tell it really wowed the kids. There was one thing that was super odd about it to my eyes, though: the theme. All the stories and text were heavily oriented towards the theme of obedience. The script was pretty heavy-handed about this. Now, that's not surprising, I'm sure, in a Vacation Bible School. But it seemed like just the sort of thing that would turn the kids off. Which was odd, because I thought everything else was so well done. Here's an example: the stage play had three teams of kids. They did an activity where each team had to assemble a puzzle under orders from their leader. The two teams that finished last were told they had "not obeyed quickly enough" and so they had to do the egg juggling activity. I'm sure they loved it. But these highly authoritarian statements made me cringe. I asked about it, and was told that the script came to them that way. I hadn't thought about it, but I did know that one can purchase bible school programs like these, with scripts and activities prewritten.